Such a narrowly defined utopia couldn’t last however — the pressure to conform was simply too great for a culture that at its core was still a diverse melting pot. By the late fifties and early sixties films began to question the values and the hypocrisy of the postwar decade, and cynicism became a thematic force in the movies — as witnessed in such films as The Sweet Smell of Success, Elmer Gantry, and The Manchurian Candidate. 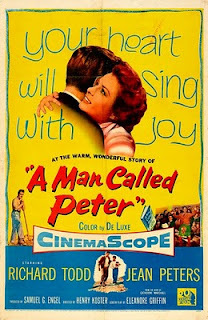 Yet 1955’s A Man Called Peter is about as sincere a movie as you’ll ever find; and being that it is contemporaneous rather than a period piece, it functions as a telling historical document as well as an entertaining biopic. It stars Richard Todd as Peter Marshall, a Scotsman called to service in his homeland, who nevertheless ends up serving in the United States. The film follows his rise through the clerical ranks from a small Georgia church, to ministering the New York Avenue Presbyterian Church in Washington DC, to becoming chaplain of the US Senate. Along the way he meets and marries Catherine (Jean Peters), and together they have a son. The film is surprisingly engrossing, with dramatic tension coming from multiple sources: his DC parishioner’s reluctance to accept him, his wife’s illness, and the Second World War. Todd and Peters are fine in their roles, the Oscar-nominated color cinematography is rich and vibrant, and Henry Koster’s direction is suits the material. If you are amenable to the subject and watch this as simple entertainment, you’re certain to enjoy it. For my part, I was more fascinated by the telling attitudes projected by the film. It certainly sees itself as progressive — time and again throughout Marshall bucks the status quo in his sermons, to the chagrin of the old folks, and tries to create a church based on equality, open and welcoming to all … well, sort of. Early on he invites a few of the younger members of his Atlanta congregation, including Catherine, to speak at a “youth rally.” When things begin to unravel Catherine rises and offers an impassioned speech about what it means to be a young Christian woman. Her sermon would have been considered hip and unorthodox at the time, but seen through a contemporary lens is characterized by its effort to place women nowhere other than the home. A sort of equality to be sure, but a separate sort at best — and Catherine’s message to those girls who might want to do the same sorts of things that men do (like work) is problematic: Why bother? Women simply aren’t meant to do such things. Here’s a girl who attends an expensive Atlanta university in order to become a teacher (of course), but after she finds her husband her career ambitions are dropped and are never mentioned again as she takes on the role of wife and mother. A Man Called Peter seems to characterize co-education as little more than a very expensive matchmaking service. Certainly the movie wasn’t the only one to take such a stance, but only the most deluded would argue that a multitude of fifties women didn’t have or aspire to a professional life. It’s also troublesome that a film that tries to deliver a message of love and equality fails so miserably whenever the issue is race. Considering A Man Called Peter is set in Atlanta and Washington DC and would likely receive many southern bookings, it isn’t surprising that it is so drastically conservative, but that being the case, why have any black cast members at all? Instead there are many, and every single one of them is a servant. We aren’t discussing a film from the thirties or forties here either, but one in theaters at the same time as The Blackboard Jungle. To cast blacks as only servants in a film such as this represents conscious pandering on behalf of 20th Century Fox to the racist attitudes of the country (and theater chain owners) at the time. It greatly mars a film in which the main character delivers a lengthy sermon about hypocrisy. Despite these flaws, there’s still much to like in this sincere film, the trick is to watch it with some sense of removal. And for those who don’t like it, A Man Called Peter yet offers a glimpse at a fascinating moment in our history. Availabilty: DVD, Netflix Instant Watch.